There is a game I love to play with Vivi, it’s the ‘Name that Spice Game‘. 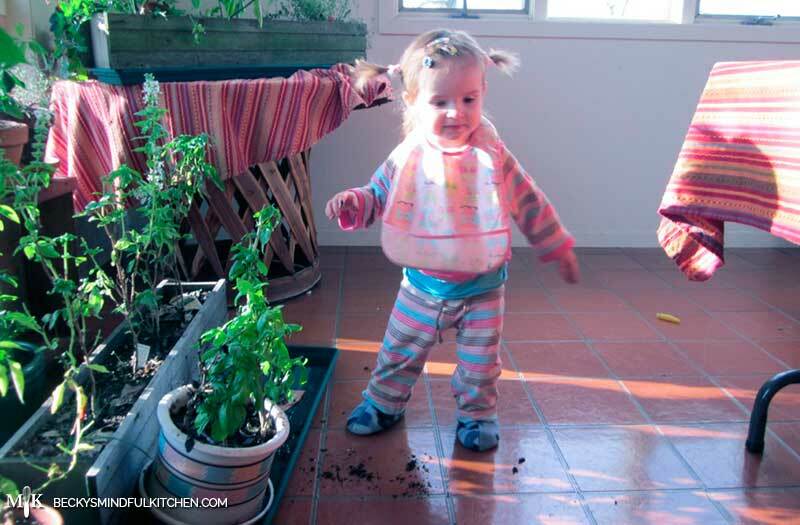 When Vivi was a toddler she would sit by the pot of basil and just munch on fresh basil. She would do the same with rosemary and parsley. Her favorite phrase was ” I like it da basil”. She loved exploring different fresh herbs and I loved watching it. I continued her herb education by having her taste different herbs and identify them. Now we do smell identification and taste and sight. I will catch her at the spice drawer checking out different spices and she has had complete control over coming up with different dry rubs for meats. It is a great way to engage your child’s senses and include them in decisions when it comes to flavoring dishes. I spend hours each day cooking and developing new recipes. I have always included Vivi in tasting my dishes and ask her opinion about what something needs and will ask her which flavors she tastes. Kids love grinding together spices with a mortar and pestle so if anything, it is a great way to keep little hands busy while you cook dinner! I buy all of my herbs and spices directly from Frontier. Frontier Co-op provides, in my opinion, the best organic spices and herbs plus they are local which is win-win. If you come to a class you will go home with free samples, as the spices from Frontier are unlike any you have ever used before. I love experimenting with different herb combinations and believe that a dish can be elevated from good to great by simply adjusting the spices used. When I started my business as a food consultant I was shocked by how many kitchens I visited that only contained a handful of seasonings and of that handful only 2 or 3 were used on a regular basis. That opened my eyes to how lucky I was to have grown up in a household where our spice cabinet contained dozens of different spices and our gardens were full of fresh herbs. See below for my list of top 15 spices to stock your kitchen with. 2) Black peppercorns and grinder- fresh pepper is a must when finishing a dish. AVOID: spice mixes as they often contain a lot of commercial salt and preservatives. Premade spice mixes are also usually old- they have been sitting on that shelf for a long time and the seasonings will have lost their potency. Come by my kitchen and smell the spices I have from Frontier- it will change how you view dried herbs.